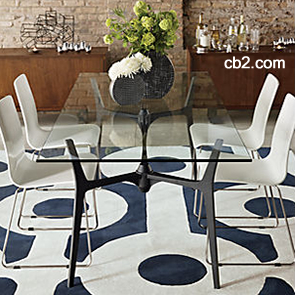 Navy/White Circles Inspired by a CB2 Roundabout Rug! Here's another homegoods inspired mani. I'm pretty sure I'd never wear this anywhere...but it's fun to find inspiration in non-beauty items. This Roundabout Rug from CB2 represents abstract London traffic loops. I recreated the effect using China Glaze First Mate, China Glaze White Out, a striping brush and small and large sized dotting tools. I painted two coats of First Mate and then striped the nails evenly in White Out. Next, I dotted along the stripes with the larger dotting tool and connected the dots horizontally with the striping brush. And finally, I went back in with the smaller dotting tool and "stacked" smaller blue dots onto the larger white dots...giving the illusion of concentric rings.